Bill Black is an Associate Professor of Economics and Law at the University of Missouri – Kansas City (UMKC). He was the Executive Director of the Institute for Fraud Prevention from 2005-2007. He has taught previously at the LBJ School of Public Affairs at the University of Texas at Austin and at Santa Clara University, where he was also the distinguished scholar in residence for insurance law and a visiting scholar at the Markkula Center for Applied Ethics. He was litigation director of the Federal Home Loan Bank Board, deputy director of the FSLIC, SVP and General Counsel of the Federal Home Loan Bank of San Francisco, and Senior Deputy Chief Counsel, Office of Thrift Supervision. He was deputy director of the National Commission on Financial Institution Reform, Recovery and Enforcement. His regulatory career is profiled in Chapter 2 of Professor Riccucci’s book Unsung Heroes (Georgetown U. Press: 1995), Chapter 4 (“The Consummate Professional: Creating Leadership”) of Professor Bowman, et al’s book The Professional Edge (M.E. Sharpe 2004), and Joseph M. Tonon’s article: “The Costs of Speaking Truth to Power: How Professionalism Facilitates Credible Communication” Journal of Public Administration Research and Theory 2008 18(2):275-295. Bill Black has detailed an alarming story about financial – and political – corruption. The specifics go back twenty years, but the lessons are as fresh as the morning newspaper. One of those lessons really sticks out: one brave man with a conscience could stand up for us all. 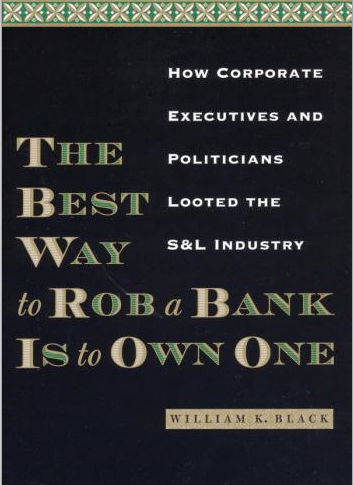 Black’s book is partly the definitive history of the savings-and-loan industry scandals of the early 1980s. More important, it is a general theory of how dishonest CEOs, crony directors, and corrupt middlemen can systematically defeat market discipline and conceal deliberate fraud for a long time — enough to create massive damage. Black developed the concept of “control fraud” – frauds in which the CEO or head of state uses the entity as a “weapon.” Control frauds cause greater financial losses than all other forms of property crime combined and kill and maim thousands. He recently helped the World Bank develop anti-corruption initiatives and served as an expert for OFHEO in its enforcement action against Fannie Mae’s former senior management. He teaches White-Collar Crime, Public Finance, Antitrust, Law & Economics (all joint, multidisciplinary classes for economics and law students), and Latin American Development (co-taught with Professor Grieco, UMKC – History).